Armament: (B 46A) 2x 0.50'' machine guns in tail turret and 22,000 lb bombs. Designed in 1944, three prototypes were ordered 27/2/45. At the end of WWII however funding was cut to just one aircraft. The XB-46 was a conventional, shoulder-wing aircraft with a thin and graceful fuselage, but it would be the fuselage which would in the end lead to it's down fall, as the USAAF concluded that the thin fuselage would not be able to hold all of the required radar equipment. 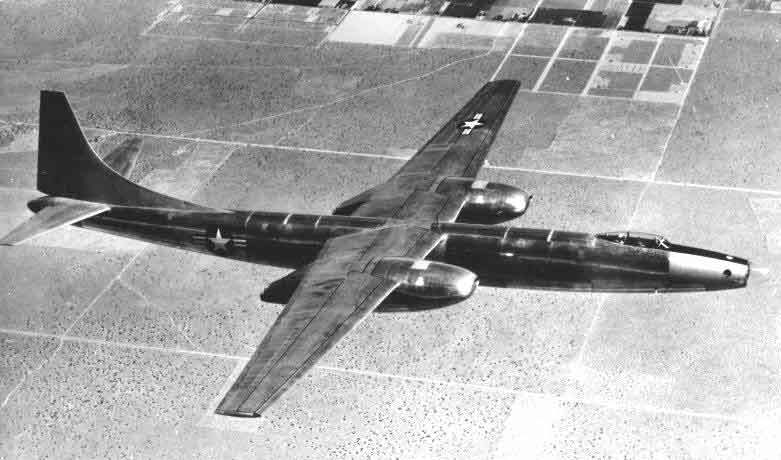 On 2/8/46 it was announced that the production contract would go to the North American XB-45, however Convair would be permitted to finish the one XB-46 for use as a test bed. The XB-46 took to the air 2/5/47 and was last to fly in 1950.